The February sun felt more unforgiving than expected although cycling after so many years was probably another reason for my exhaustion. However, my spirit was not affected by it as it was also the month of “Phagun”, the first Indian month of spring when the sky is set ablaze by silk cotton blossoms and hormones dictate the terms of young (and not-so-young) hearts. Majuli is in fact the perfect place to experience the onset of Indian spring as it remains minimally touched by urbanization and the nature is visible in its rawest form. I arrived in Majuli the previous evening after the customary motorboat ride. This would have been a piece of banal detail in any other place but in Majuli, this is an experience in itself. Boats are the only way to reach the island that is in danger of losing its tag of “World’s Largest River Island” due to continuous erosion caused by the Brahmaputra. Nevertheless, the muscular Brahmaputra is also the reason that makes this boat ride memorable. Even in the dry winter, it is vast enough to make the other bank invisible and currents are strong enough to make this short ride last more than an hour. I paid a miniscule fee of INR 15 for a one-way trip from Nematighat near Jorhat to Kamalabari Ghat in Majuli. This is a fixed rate that is mentioned clearly on a notice board. However, a closer look at the same board revealed some more interesting details. The board mentions the rates for many other items including cycles, personal vehicles as well as commercial vehicles which were expected. But it also has rates for cows, horses, pigs, goats, chicken, ducks, and more importantly, for Elephants. I am not sure why would anyone take an elephant to Majuli but I think this little detail is a remnant of more innocent times when the elephants performed most of the tasks now done by cranes and trucks. These boats always remain packed with people, vehicles and goods. Instead of sitting inside and risking motion sickness, I preferred to climb up to the roof of the boat to get fresh air and 360 degree view of the river. The roof does not really have any railings and there is a genuine possibility of falling off in case something goes wrong. So, I remained in the middle of the roof, clutching onto the window of the driver’s cabin but the ride actually turned out to be pretty smooth. The locals knew it and so they were sitting on the edge of the roof nonchalantly. Buses and shared cars were waiting on the other side to take the passengers through a stretch of white alluvial sand that could match up to any exotic beach. Once I crossed this stretch, the rest of Majuli felt exactly like any other rustic area in Assam. I checked into a small lodge in Kamalabari and waited eagerly for the next day. Usual rustic scenes dominated by bamboo groves. I started early in the morning and deliberately left the main road to cycle through the Mishing villages. Out of all the tribes living in Majuli, Mishings are the largest in numbers and their rice beer has a certain reputation. I was not sure how to get hold of that but I was hoping against hope. The bystanders were looking at me with curiosity. I’d tried hard not to look like a tourist but I guess a man riding a ladies cycle, a bright pink one, was enough to attract attention. But I could do nothing about it as this was the only option offered by the cook of the lodge I stayed in. Eventually, one of them could not resist the temptation and started waving at me. I was at a reasonable distance from him and he had to yell at me to get heard. I was startled at first but soon realized that he merely wanted to share his drink, and share his sorrow with a stranger. It was Mr Mili, a local farmer who was sitting by the side of the road near his humble hut overlooking a small plot of land that he owns. He was already downing bowls after bowls of apong (home-made rice beer) at 8 in the morning. I approached him slowly and introduced myself as a tourist. He offered me a bowl too and we started talking as a couple of other villagers also gathered around us. Mr Mili’s plot of land, freshly planted with emerald green paddy, did look very fecund that morning. However, he did not seem very enthusiastic about it. Floods are regular occurrences in the state and due to its sheer location in the iddle of the river, most of Majuli gets inundated every monsoon. So, the survival of his crops also depend on the severity of the flood during the rainy season. I slowly began to understand the reason for his drinking habit. Life is not easy for him, and for most of the people in the island who are into farming. Many of his ilk have left for bigger towns in search of work and he regrets not doing the same. Unlike people like him in other places, he also can’t rear pigs or sell beer because that is something not looked very favourably by the Satras, who control religious and cultural aspects of this land (This may be the reason for spread of Christianity in some remote corners of the island but that is a different story). He did not know that I have a habit of writing but he urged me to tell his story to other people and I promised him to do so. The crowd was beginning to grow around us and my bowl of apong had been refilled several times already. Since the day had just started and I still had to cycle myself around the island, getting drunk was not an option. So, I reluctantly excused myself and got going again. Something whizzed past me as I left that village and arrived at an open area. It was a very colourful bird but I couldn’t really figure out what it was. I stopped and searched for a while in vain but I was compensated by the sight of a stork and a cormorant sitting atop a flowery silk cotton tree in the horizon! That was the moment I realized that Majuli is an avian paradise too although this aspect of the island is rarely talked about. More than 260 different species of birds have been recorded here so far including permanent residents and migratory species that arrive in the winter. Even during my short stay and even without an guidance or equipment, I managed to spot various types of storks, cormorants, herons, egrets, kingfishers, white-breasted waterhen and purple moor hen along with others that I could not identify. By the end of the day, I was convinced that Majuli is a birder’s paradise waiting to be discovered. Needed to carry better zoom for this white-breasted waterhen. After spending several hours around nondescript villages, I decided to make a quick round of the primary attractions of Majuli, the Satras. For the uninitiated, it must be pointed out that these Satras of Majuli have been the cultural pivot of most parts of Assam for at least five centuries. The neo-vasihnavite movement of Sankardev in the 15th century formed the basis of its culture by nurturing local literature and various art forms. While there are Satras everywhere in Assam, for some reasons, Majuli became the preferred place for the saint and his disciples. At one point of time, only the island of Majuli had as many as 65 satras although many of them are not functional anymore. Some of them have also been relocated to other places as the original sites have been consumed by erosion. But still, many of them are thriving and they play a major role in the social life of the locals because these were conceived and designed as socio-cultural institutions rather than purely religious sites of worship. It was not feasible to visit every satra in a day but I decided to cover as many as possible. I paid visit to Garamur, Auniati, and Kamalabari Satras while I cycled past many others. It is impossible not to see a satra in Majuli as they are located in every corner. While they may all look the same from outside, all of them have their own specialities. For example, Garamur has its own museum that preserves many medieval items including coins, weapons, and gifts exchanged between the Kings and the religious heads. On the other hand, Auniati is known for its dance and drama performances while Kamalabari is known for boat-making. You should have more days at hand you want to explore them properly and experience cultural performances. However, these satras seemed to be a bit too popular, crowded with devotees and visitors. They were also nearer to the Kamalabari-Garamur stretch, the only partially urban area in the island. I wanted a more intimate conversation with someone but everybody seemed busy in these ones. So, I decided to gamble a bit and set off for Notun Samaguri Satra, which was a bit far away on the other side of the island and was expected to be less crowded. 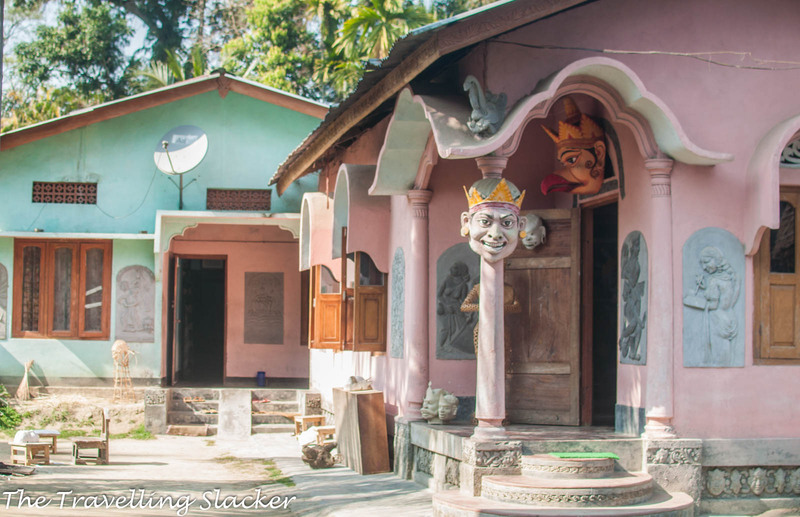 It is another unique Satra that is known to be the centre of Majuli’s mask-making culture so this was something I needed to visit anyway. Finding this Satra turned out to be a challenge but it was exactly what I needed it to be. It did not even look like an institution. It was just another small, unassuming house that I initially failed to spot and cycled past. But as I finally entered inside, I immediately realized that this was the perfect place to wind up a fruitful day. The walls inside were adorned by some rather alarmingly expressive heads, most of which belonged to various mythological demons. These masks are used by actors enacting these roles in the traditional “bhaonas” or dramas that tell the stories of Ramayana and Mahabharata. I wanted to meet Hemchandra Goswami, the Sattradhikar (Head of the Satra), who is also an award winning artist who has kept this tradition alive. Unfortunately, he was not around but soon I realized that the entire family is involved in this process. I managed to meet Dhiraj Goswami, another member of the family who was busy giving shape to yet another mask. He showed me around and explained the process. He even wore one of the masks and demonstrated how it is used. 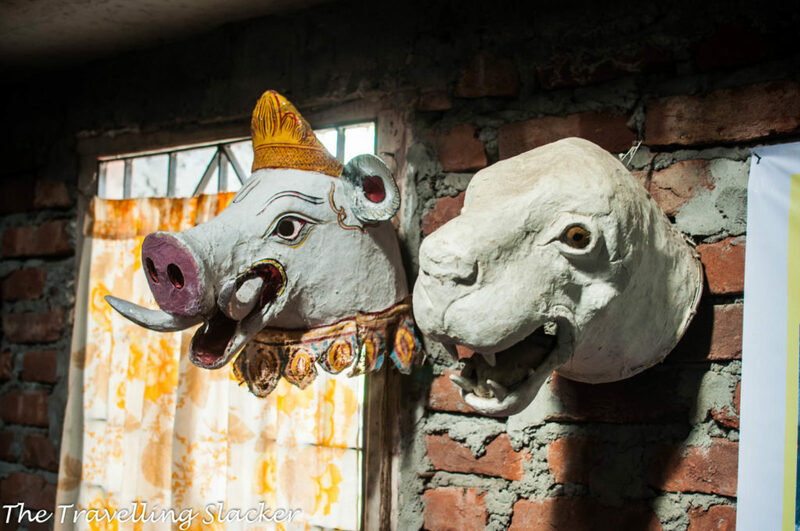 For several centuries, these dramas have served as the only source of entertainment and education for the local populace and these masks made this possible with a bit of imagination. Good place to leave nagging kids alone. I left Majuli with a sense of contentment of having seen a lot within a short span of time. But at the same time, some part of my mind was worried because the erosion is still going on and the island shrinks every monsoon. Various projects have been undertaken by the administration to protect it but it remains to be seen if they succeed. Nevertheless, for tourists, Majuli is only beginning to open up. I spotted a lot of foreign visitors cycling around the island just like me. Some of them were even staying in the satras and studying various arts. The tourist inflow will surely increase in the coming times and I think this is where my farmer friends can also try their luck to overcome the tyranny of the river. The place where the soil merges seamlessly with water. A wonderful write up beyond the usual landscape stories of Majuli.